The text, visuals, and assessments of How Life Works, Second Edition, come together most effectively through LaunchPad, Macmillan’s integrated learning management system. 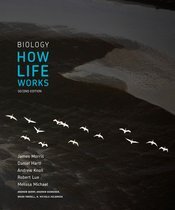 In LaunchPad, students and instructors can access all components of Biology: How Life Works. LaunchPad resources for How Life Works are flexible and aligned. Instructors have the ability to select the visuals, assessments, and activities that best suit their classroom and students. All resources are aligned to one another and the text so that instructors can be sure that the resources provided to their students will be effective tools to teach them the needed skills and knowledge for majors biology.